Gees!! You still sleep!! 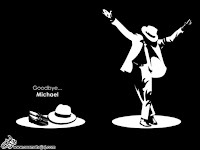 Walek Michael Jackson passed away yesterday!! I looked at him and was surprised about what he said!!.. I mean.. I know that eventually we are all going to die.. But never thought about Michael dying.. It’s just never occurred to me..
Then when I was completely awake.. I said in my mind.. How sad.. Really sad news!! We’ve always listened to his songs when we were little and were amazed by his dancing moves & exclusively outfits..
Now I’ve remembered.. Tab Beat FM & Sunny are giving away two tickets for one of his first shows.. Olak what would they do now!! Thank you Michael A.K.A King Of Pop.. Your songs are timeless and dear to me..